Ireland will learn their Euro 2016 fate on 12 December. Pot 1: Spain, Germany, England, Portugal, Belgium. Pot 2: Italy, Russia, Switzerland, Austria, Croatia. Pot 3: Poland, Romania, Slovakia, Hungary. Pot 4: Ireland, Iceland, Wales, Albania, Northern Ireland. *Czech Republic could be placed in Pot 2 or 3 depending on what teams qualify from the play-offs. *Turkey could be placed in Pot 3 or 4 depending on what teams qualify from the play-offs. Pot 2: Italy, Russia, Switzerland, Austria, Croatia, Ukraine. Pot 3: Czech Republic, Sweden, Poland, Romania, Slovakia, Hungary. Pot 4: Turkey, Ireland, Iceland, Wales, Albania, Northern Ireland. In Pot 1/A1, holders Spain, hosts France and world champions Germany (notwithstanding Ireland’s terrific performances against them in the qualifiers) look like the teams to avoid. Belgium are currently top of the Fifa Rankings, yet both Bosnia and Wales took points off them during qualification. England had a 100% record in qualifying, though they have a well documented recent history of disappointing at major tournaments. Portugal qualified comfortably and have probably the tournament’s best player (Cristiano Ronaldo) at their disposal. In Pot 2, Croatia and Italy both qualified from Group H automatically and look to be among the tougher opponents Ireland could come up against. Austria and Russia both advanced from Group G, with the former comfortably finishing ahead of the latter. Switzerland advanced with relative ease as the second-place team in England’s group. Ukraine, as mentioned, are looking good to qualify from the play-offs, after coming third in Group C behind Spain and Slovakia. Finally, in Pot 3, Romania and Hungary finished second and third respectively in Group F (which Northern Ireland won), while Sweden came third behind Austria and Russia in Group G. Czech Republic topped Group A, helping to knock out the Netherlands in the process. Ireland already know all about Poland, who ultimately consigned Martin O’Neill’s side to their play-off faith, while Slovakia were second in Group C, ahead of Ukraine but behind Spain. Best-case scenario: Portugal, Switzerland, Hungary. Worst-case scenario: Spain, Italy, Czech Republic. The draw for Euro 2016 takes place on 12 December. More info here. 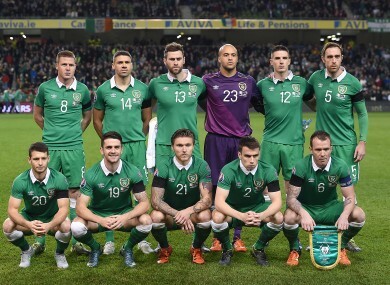 Email “The best and worst-case scenarios for Ireland in the Euro 2016 draw”. 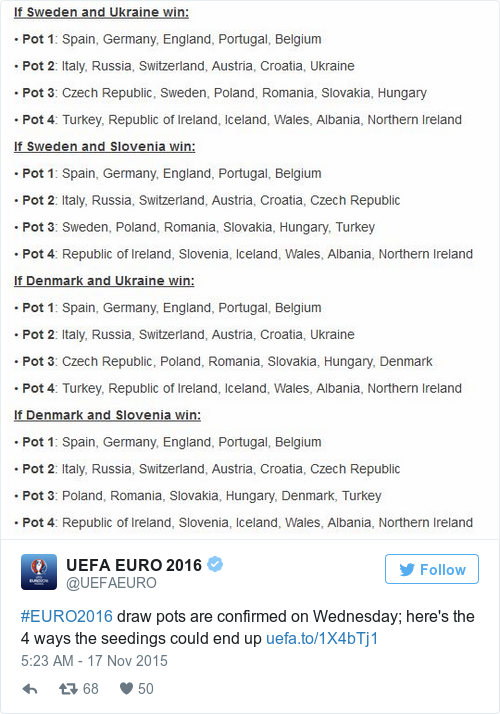 Feedback on “The best and worst-case scenarios for Ireland in the Euro 2016 draw”.